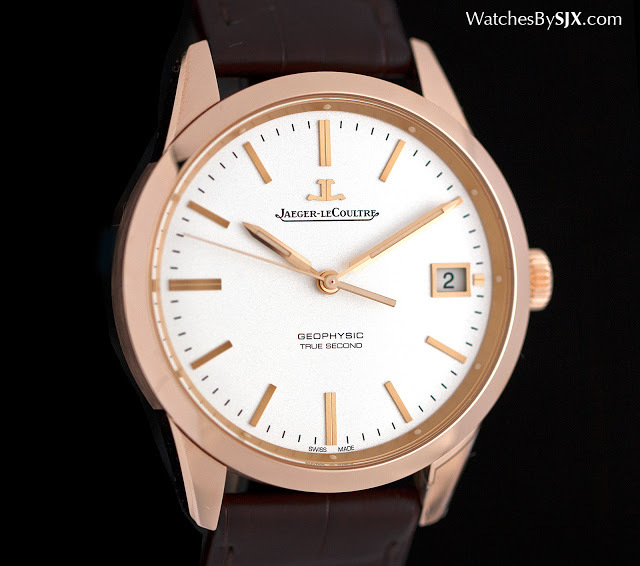 A vintage-style wristwatch powered by a bona fide in-house movement, for a relatively accessible price, the recently introduced Geophysic True Second is all of what Jaeger-LeCoultre excels in. 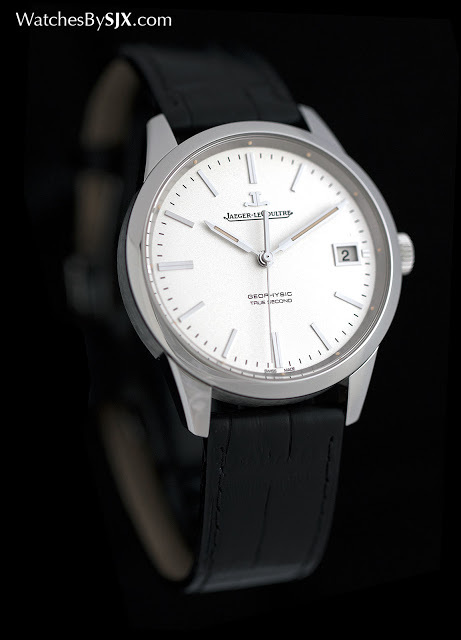 Jaeger-LeCoultre‘s follow-up to the well received Geophysic limited edition launched in 2014, the Geophysic True Seconds sports a look reminiscent of gentlemen’s wristwatches from the late 1960s or early 1970s. But it does not just rely on its retro looks to get by. The Geophysic True Seconds is equipped with the calibre 770, a new movement featuring a deadbeat seconds and independently adjustable hour hand. Like the Geophysic limited edition, the new True Seconds is a vintage-inspired design blended with a vague idea of precision chronometry. The Geophysic remake was modelled on the namesake chronometer of the 1950s conceived for the International Geophysical Year (IGY), intended for scientists and explorers of the IGY expeditions. But the first Geophysic reissue contained an ordinary movement, the workhorse calibre 899 also found in the brand’s entry level Master Control Date. In contrast, the Geophysic True Seconds is powered by the calibre 770, a recent development that makes its debut here. The calibre 770 is an automatic movement with a 40-hour power reserve with three notable features. One is the deadbeat seconds, which means the seconds hand ticks forward in one second steps, just like a quartz watch. Naturally, it is not a quartz movement, instead extra gearing has been added to give the seconds hand its ticking motion. That’s partially visible underneath the rotor, with an aperture in the bridge that reveals the tiny tension spring for the deadbeat seconds gear. 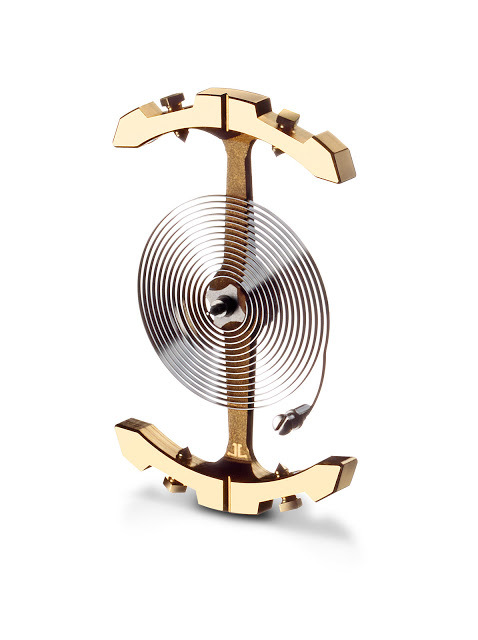 The rotor is made of 18k rose gold and open-worked to form a large Jaeger-LeCoultre. 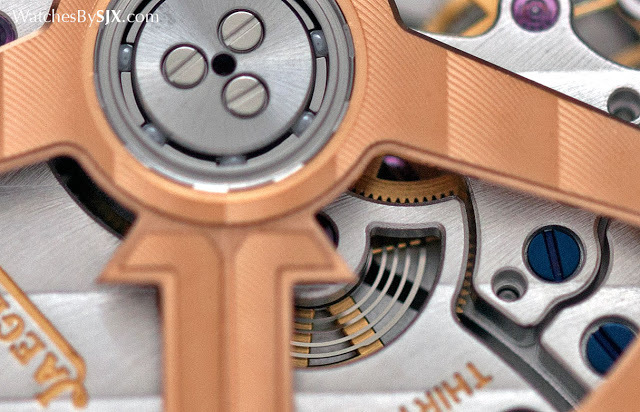 The prominent grain of the striping on the rotor indicates the decoration has been engraved by machine, rather than applied with a spinning pad as done for the softer stripes on the movement bridges. 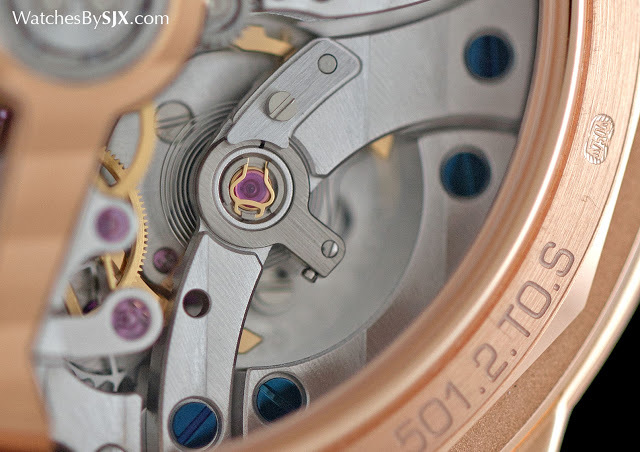 Another feature of the calibre 770 is the independently adjustable hour hand. With the crown pulled out one stop, the hour hand can be advanced in one hour intervals, without affecting the position of the minute or seconds hands. This is useful when changing timezones as it allows the wearer to set the watch to a new timezone without losing the previously synchronised time. And the calibre 770 also utilises the new Gyrolab balance wheel. 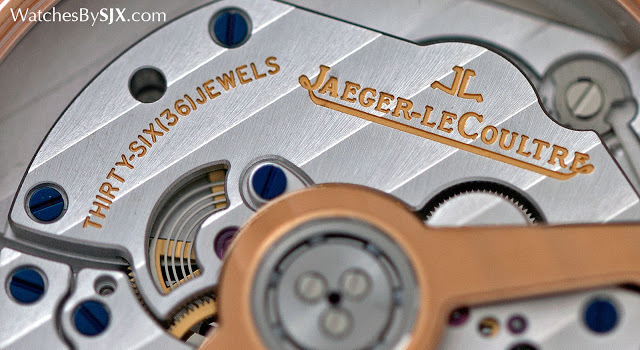 Unlike a conventional balance that’s a complete circle the Gyrolab is shaped like somewhat like the Jaeger-LeCoultre logo, with adjustable weights for regulation. It’s supposed to function more efficiently because it has less air resistance when in motion. While that may be true, the functional benefit is likely marginal. 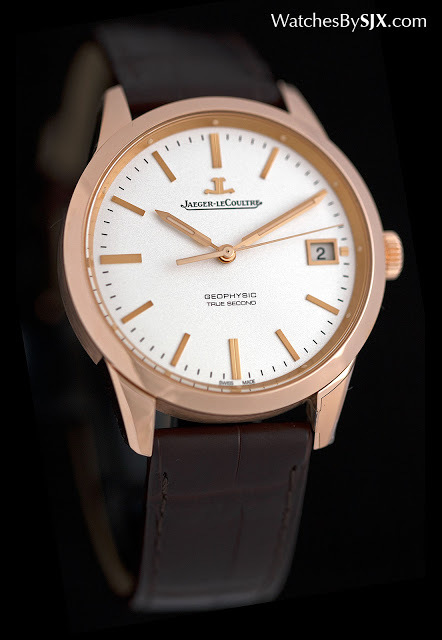 The Geophysic True Second has an air of the early 1970s about it, with its straight lugs, baton indices and pencil-shaped hands. It’s a classical and uncontroversial look, one that’s right for the tastes of the market at the moment. 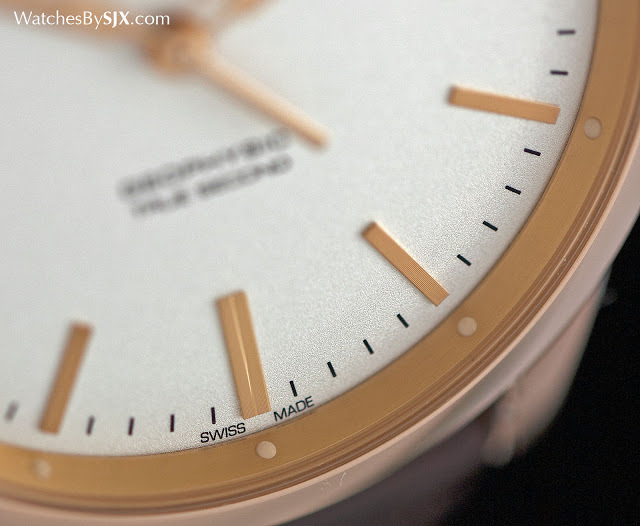 Up close the dial does offer some extra detail, including the grained silver surface and the luminous dots on the sloped surface of the dial flange. That’s a detail taken from last year’s Geophysic limited edition. Like the rotor, the applied elements of the dial (hour markers, date window frame and logo) have been cut with a diamond-tipped tool, a process that leaves behind characteristic striations visible up close. 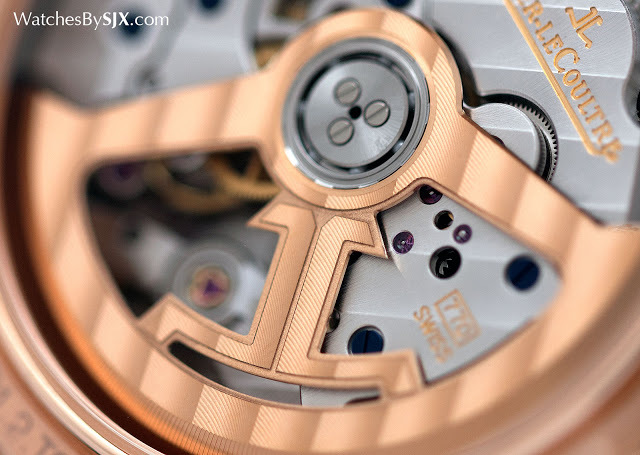 Available in pink gold or steel, the case is a good 39.6mm in diameter with a height of 11.7mm. Not overly large, the volume is still enough to give it a satisfying feel on the wrist. It helps that the watch is relatively thick compared to its diameter, because the deadbeat seconds mechanism adds significantly to the height of the movement. The calibre 770 is 6.57mm high; in comparison the calibre 899 in last year’s Geophysic limited edition is just 3.3mm. Though nearly identical, one key difference between the steel and gold versions is the colour of the Super-Luminova on the dial. The steel sports parchment-coloured lume, giving it a significantly more vintage look than the pricier pink gold model. 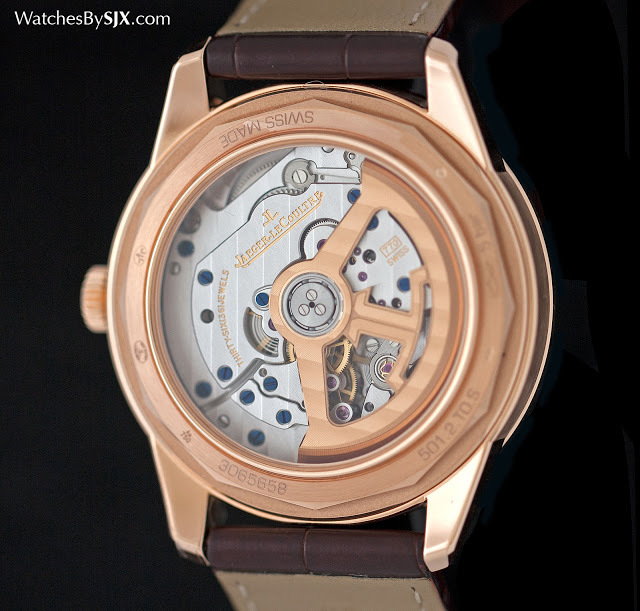 The Geophysic True Second in steel is priced at S$13,300 or US$9050, and in pink gold it costs S$25,900 or US$17,500. 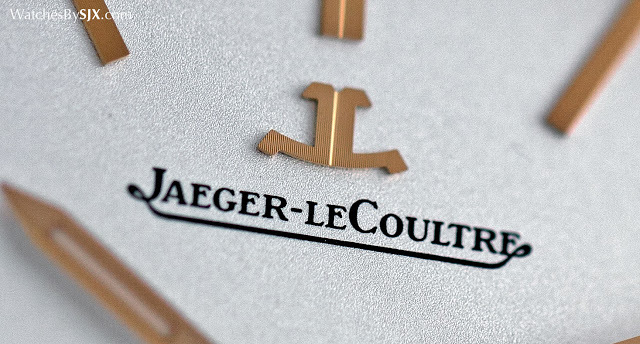 It is already available in Jaeger-LeCoultre boutiques and authorised retailers. 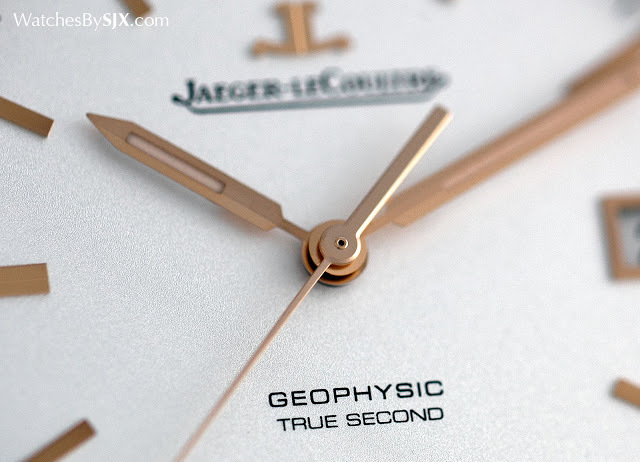 A world time wristwatch equipped with a deadbeat seconds movement, the Geophysic Universal Time is a modern take on Jaeger-LeCoultre's classic explorer's timepiece. Here's a hands-on look, complete with original photos, review and pricing. 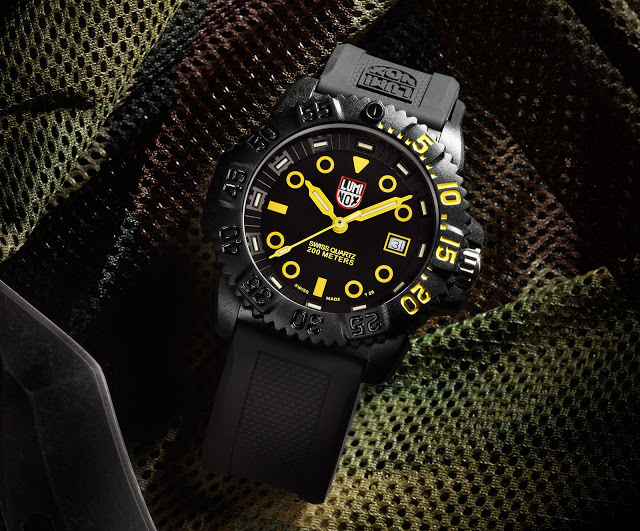 Featuring a dial illuminated with both tritium gas tubes and Super-Luminova, the Luminox Navy SEAL Colormark Nova takes nighttime legibility seriously. 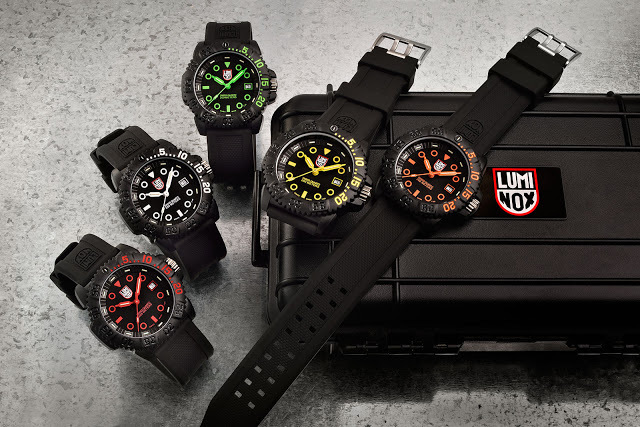 The latest version of the tough watch Luminox supplied to the US Navy SEALs in the 1990s is the Navy SEAL Colormark Nova. Affordable and no-nonsense, the Navy SEAL Colormark Nova is offered five different colours, equipped with a dial that glows exceptionally brightly in the dark, thanks to both tritium gas filled vials and Super-Luminova. Tiny glass vials filled with tritium gas are fitted to the chapter ring, hands and 12 o’clock market on the bezel. These glow in the dark all the time, because of the radioactivity of tritium. The tritium gas vials at 12 o’clock and at the five minute markers from one to four o’clock glow in different colours from the rest, so that the watch can be used to mark the elapsed time during a dive, even in murky or dark waters. The hour markers on the dial, on the other hand, are painted with Super-Luminova, a non-radioactive substance that requires charging with light. 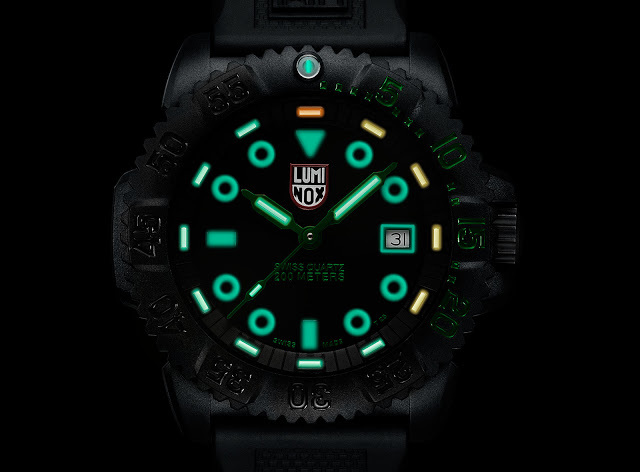 Exposed to sufficient light – the light excites the particles in the Super-Luminova – the lume a will glow for hours in the dark. The Colormark Nova is 44mm in diameter, with the case made from carbon-reinforced polymer, a light and hard composite material. Each watch is accompanied by a black rubber strap. 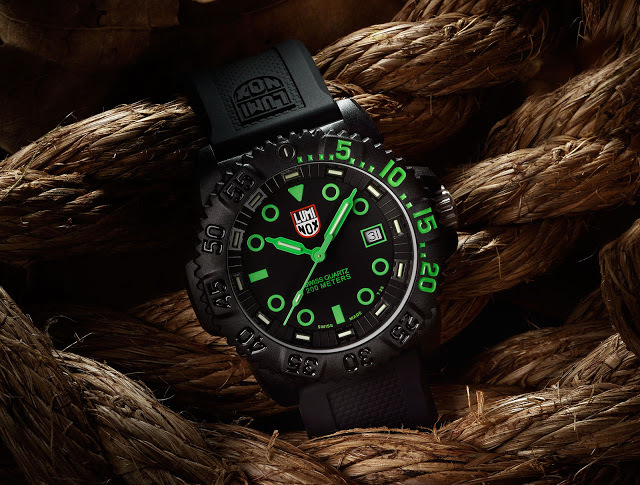 For a limited period after the launch in November 2015, Navy SEAL Colormark Nova will be packaged in a waterproof Pelican case along with an extra canvas “Zulu” strap to match the dial colour. 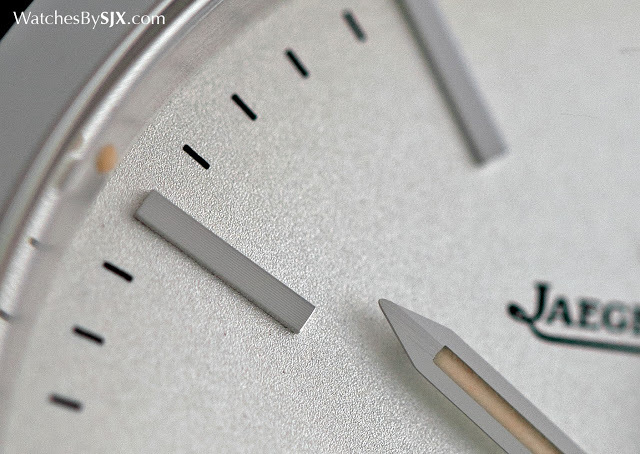 The Navy SEAL Colormark Nova is priced at S$595 before taxes, equivalent to US$417.